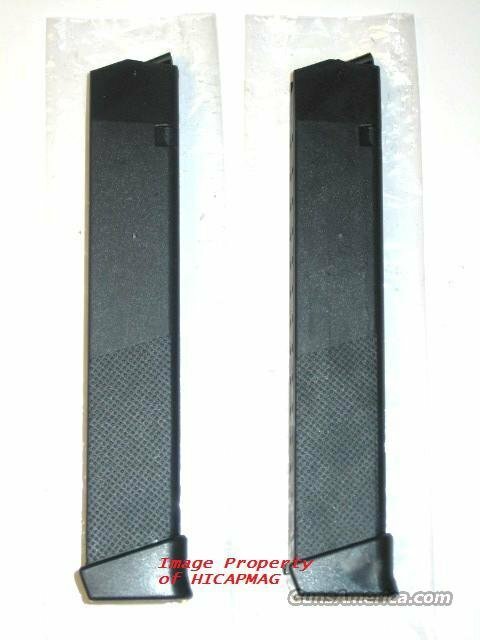 Description: 2 New version KCI 31rd Magazine for the Glock model 22,23 27.40 S&W cal and also fits the models 31-32-33 .357 Sig cal or the KEL TEC sub 2000 .40 cal That uses Glock Magazines as well as the .40 cal JR Carbine.. Now with a stippled lower body for improved performance. This metal lined mag is made to the same excellent standards as the Glock factory mags and is the drop free design. It also has the notch cut in the front for the ambidextrous mag release and is set up to work with GEN 4 Glock pistols.. Payment to be made by Certified Check, Money Order, or Personal Check (Item held till cleared). Sorry, no PayPal or Credit Cards. Check out my other auctions, as I combine shipping. No sales to NY, MA, HI, CA, PR NJ. MD. CT. CO. shipped only where legal.